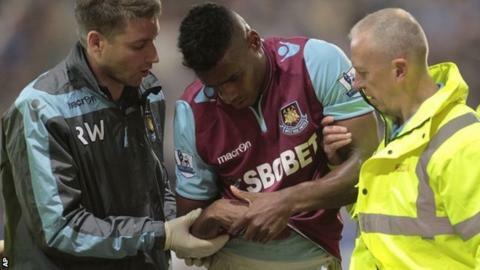 Sam Allardyce revealed West Ham striker Ricardo Vaz Te dislocated his shoulder in the Hammers' 3-1 defeat by Arsenal. Vaz Te, 26, fell heavily after colliding with Arsenal goalkeeper Vito Mannone in the second half. "Ricardo Vaz Te has a shoulder dislocation by looks of it so that's not so good," said the West Ham boss. Guy Demel was also brought off with a thigh strain, Winston Reid played on with a back spasm and Andy Carroll played 90 minutes on his full return. Allardyce had used all of his substitutions by the time Reid suffered his problem so was forced to leave the New Zealand international on. "Guy Demel looks like a thigh strain and Winston Reid had a back spasm but we could not bring him off, so that's a little worrying for us," said Allardyce. The Hammers manager admitted he did not want to play Carroll for the full 90 minutes. The England international, 23, made his first start since suffering a hamstring injury in West Ham's 3-0 win over Fulham in September, having come off the bench in the Hammers' 2-1 win over QPR on Monday. Allardyce had agreed with England manager Roy Hodgson that the striker would not play the full game ahead of the upcoming World Cup qualifiers against San Marino on Friday 12 October and Poland on Tuesday 16 October. But the West Ham manager was forced to leave the former Newcastle forward on because of West Ham's injury problems. Carroll had a great chance to score when the game was level at 1-1 but he headed just wide and the Hammers boss believes the 90 minutes will benefit him. He said: "Carroll is fine, I spoke to Roy Hodgson this week. We didn't want him to do 90 minutes today but because of the injuries we had to and it would have done him the world of good. "It's a shame he didn't score, that one header dropped the wrong side of post. Hopefully he will be fit for a long time now and be an asset to us."